First time playing Treasure Adventure World? This quick guide should get you going. The first thing you should do is check/setup your controls. From the Title Screen select "Controls". On the controls screen select between keyboard or, if available, controller. Then choose from a default control scheme at the bottom of the screen OR create your own scheme. If you have an Xbox 360 or Xbox One controller you will have an additional option to toggle force feedback vibration. With the controls set, start a new game by clicking "Play" from the title screen. Select the "New Game" tab at the top. Your adoptive Grandmother has awoken you from a strange dream of a beautiful goddess who urges you to find your missing family and fulfill your destiny... now what? 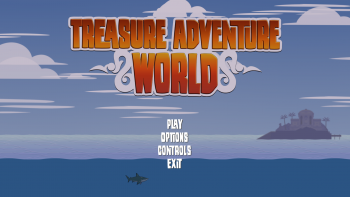 Treasure Adventure World is a non-linear game that allows you to discover the world and tackle quests your way. However, before you can freely explore you must complete a few quests. 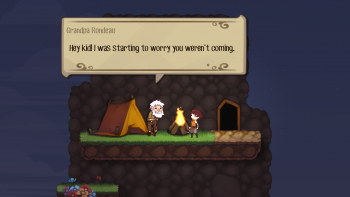 Grandma Ethor wants you to visit Grandpa Rondeau at the top of Cargale Bluff to the east. But, before you can make it there you need to find your missing Hook prosthesis (Yes, you are missing your right arm, and no you don't remember how you lost it). Asking the neighbors reveals that the mean kid next door, James, has hidden it in his secret hideout near his mother's garden. Go outside and explore around Adrienne's garden - look for a clue to the entrance to the hideout. Did you see that mouse? Try following it. Stand in front of the treasure chest and press Action. You've found your Hook! The gate closed and now you're stuck. James set up a trap! Look for a way to open the gate. Press Attack to swing your Hook at the red lever on the wall. You're free again! Now that you have your Hook back you can jump up and grab hooks and ledges - allowing you to fully explore Cargale Island. Feel free to do so before continuing on to Cargale Bluff. Cargale Bluff is on the far right side of the island. Make your way there. The entrance to the Bluff is through a tall cave. Look for the sign for the cave entrance. Once inside be aware of the dangerous creatures inside. If they touch you, it'll hurt. 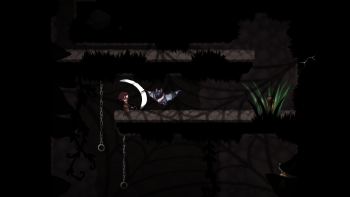 Press Attack to swing your Hook at the spiders and bats - you'll vanquish them after a few good hits. Continue to jump and fight your way up to the top of the cave... and it never hurts to explore a little. You'll reach a red lever and a gate - this is easy, you've got this. Now that you're on the other side of the gate you need to close it again to proceed up. If you're quick enough you can activate the gate and run past it before it closes. 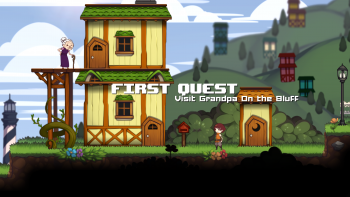 Reach the top and head outside to be greeted by your adoptive Grandpa Rondeau, who has a very special present for you. With your gift acquired, head back home on the left side of the island. You can jump down from the bluff or go back through the cave. After speaking with Grandma head inside and go to sleep. Stand in front of your hammock and follow the prompt. Whydah, a talking parrot, wakes you up in the middle of the night and urges you to help him on his quest to find 12 Legendary Treasure. Given a chance at finding your lost family, and because Whydah won't take no for an answer, you agree to accompany him. 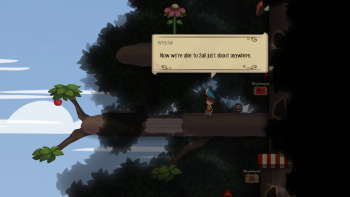 In order to leave your island and begin the adventure, Whydah suggests you find a boat. Mattie is testing an invention on the docks near your house. It could prove useful. Before you can borrow her shrinking boat, Mattie needs an Exitium crystal. Make your way to Brooks and Barney's house near the center of the island. It's the green house. Once Whydah breaks in and unlocks the door, go inside and carefully look around for clues to the location of the Exitium Crystal. Crawl under the table and fall through the floor to the basement. The crystal is locked behind a gate. The nearby switch opens the gate. The switch is powered on by pressing the button on the floor. But from here you can't hit the switch. Pick up one of the fruit laying around and drop in on the button. Hit the switch and open the gate. Pick up the Crystal and take it back to Mattie. You can jump and throw the Crystal to higher ledges. Mattie let's you borrow her boat - you are now free to explore the world (almost). The Glooskap won't get you far without a better sail! Whydah knows where to get one, and provides a Navpearl. Follow the pearl west to AngelOak Island, and start climbing! You'll have several encounters with Enemies, fight them to earn some money! You'll reach the left side of the tree the second time to find a pawn shop. Spend 100 coins to buy the Sail from Vinnie and the world is yours to explore! The rest is up to you! 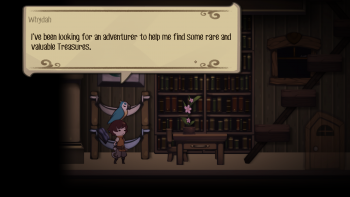 Good luck, adventurer! This page was last modified on 23 January 2018, at 18:48.